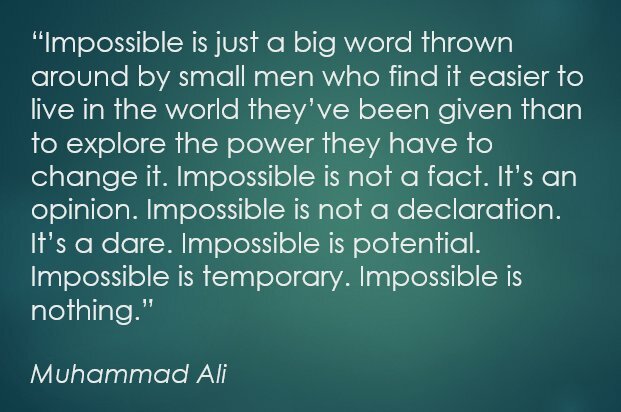 "As tributes have poured in this weekend from world leaders and sporting figures, boxing fans and political activists following Muhammad Ali’s death, it’s clear that, from beginning to end, he understood he had a job to do while he was on the planet – inspire people." 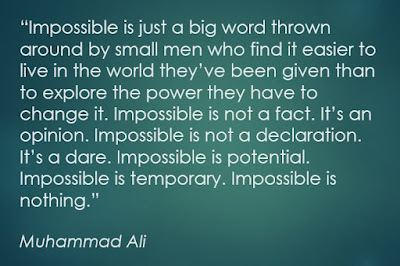 As we pay tribute to a great man, let us also take time to memorialize the everyday people who never achieved fame or fortune but whose lives built a foundation to shelter posterity. Many of these ancestors have labored without recognition and their memorials are either non-existent or are fading away. Perhaps the beautiful memorials to Muhammad Ali can inspire us to remember our ancestors and the forgotten people throughout the world. Gravestones have been used for centuries to serve as a memorial to the life of a loved one. Many ancestors are unfortunately buried in unmarked graves. A gravestone was an expense that many families could not afford. Wooden markers were used on many graves. Wooden markers are biodegradable and do not survive for very long. Gravestones can get buried or washed away by flooding. Even gravestones are biodegradable over time. Photographing and preserving images of gravestones can ensure the long term preservation of the information that they contain. What about the unmarked graves? There are many more volunteers that are involved in similar efforts throughout the world. The importance of this cemetery preservation effort for genealogy cannot be overstated. Cemeteries put our ancestors in a geographic and historical context that is essential to understanding their lives. For example, one of my recent projects has focused on the Brookins and Holmes families of Smith, Van Zandt and Henderson Counties in Texas. 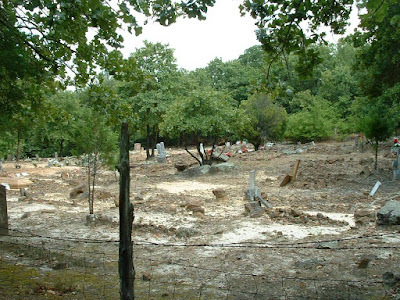 I was able to locate memorials for members of the Brookins family in two cemeteries: Big Rock Cemetery in Van Zandt County and Stockard Cemetery in Henderson County but apparently there are several more unmarked graves. Lela Holmes was born on February 11, 1871, in Texas, the child of Milo Holmes and Rhoda Johnson. 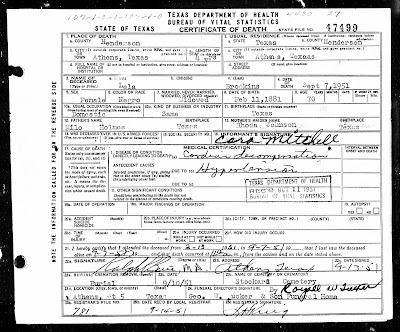 She married Nelse D Brookins on June 12, 1889, in Van Zandt County, Texas. They had 15 children in 29 years. 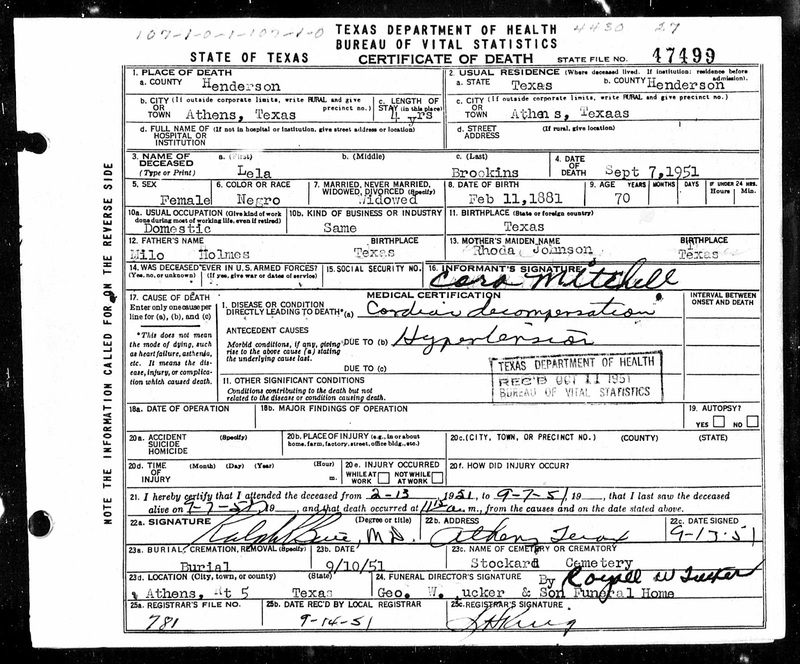 She died on September 7, 1951, in Athens, Texas, at the age of 80.
o She was a resident of Henderson County for 60 years which means that she came to Henderson County in 1891. There is a USGenWeb page for the Stockard Cemetery which shows that Lela Brookins is buried there, so presumably there is a grave marker which has not yet been photographed. The Find a Grave page for Big Rock Cemetery is very informative about the history of the Big Rock community both black and white. 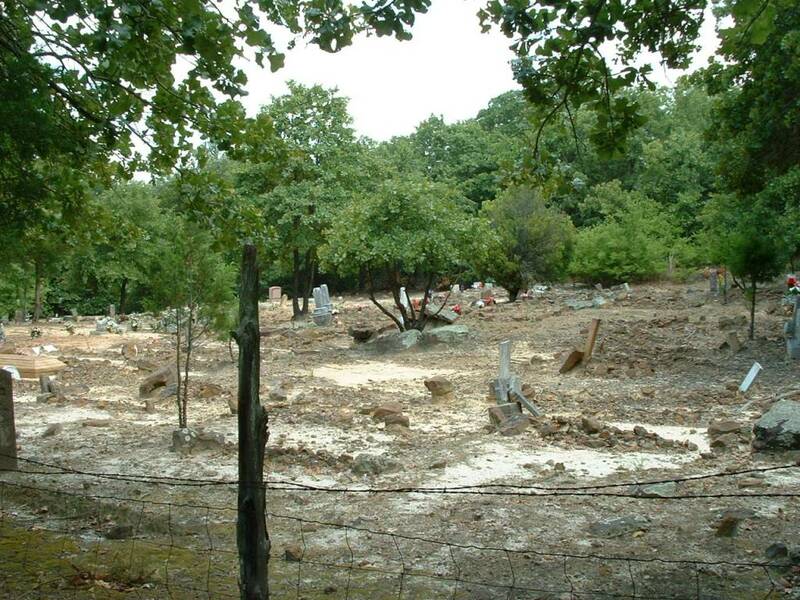 As you can see in the following photograph there are many unmarked graves. 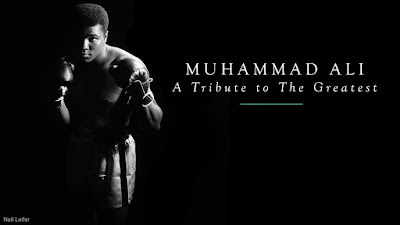 Muhammad Ali is an inspiration to me to memorialize all of America's forgotten heroes.